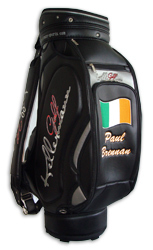 I received my new golf bag on friday, I am thrilled with the speed with which you had it finished and shipped. I am thrilled with the quality of the bag and the high quality if the stitching. Once again thank you very much, I know my friends will be very jealous and will probably want one too. I received the golf bag today and would like to sincerely thank you for everything. The bag turned out better than expected and im delighted with everything. Thanks for all the time and effort that you have put into this purchase. 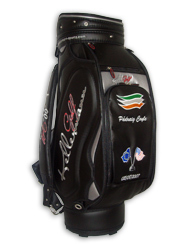 Tour Bag Montecastillo "Exclusive Design"
I have recieved the bag and it's perfect. Thank you.